If you think "The Mighty" is yet another bland family feature about the bond between two misfits, think again. Based on the best-selling juvenile novel "Freak the Mighty", this exceptional drama tells an endearing story that will touch audiences of all ages, transcending its "After-school Special" trappings. Director Peter Chelsom ("Hear My Song") has crafted a truly heartfelt film about triumph over adversity. Full of humor, emotion, and intelligence, "The Mighty" is a crowd-pleaser that pushes all the right buttons... without resorting to cheap sentimentality or being 'cute'. 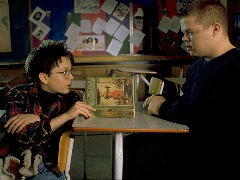 Max (Elden Henson) is an outcast that has failed the seventh grade twice due to his limited literacy skills. Despite his enormous stature compared to his classmates, he is subject to their cruel schoolyard taunts and teases. Being a gentle soul, he never retaliates against the ridicule. Instead, he averts his eyes and moves on. His home life is not much better-- with his mother dead and his father in jail, Max is under the care of his dour maternal grandparents, whom he calls Gram (Gena Rowlands of "Hope Floats") and Grim (Harry Dean Stanton of "Fire Down Below"). How can someone so small have such a big mouth? He comes to know his new next-door neighbor, Kevin Dillon (Kieran Culkin). Kevin is also an outcast, afflicted with a debilitating disease known as Morquio's Syndrome, leaving him unable to walk without crutches or endure the mildest physical activity. But despite his deformity, Kevin is a bright boy wise beyond his years, and is not afraid to speak his mind, which is often to his own detriment. The relationship between these two misfits begins with Kevin tutoring Max in reading, using a book on the Arthurian legend as a tool for education and inspiration. I need legs, you need a brain, and the Wizard of Oz doesn't live in Cincinnati! These two fast friends then form a symbiotic relationship, with Kevin riding atop Max's shoulders, and the two boys functioning as one-- an entity Kevin dubs "Freak the Mighty". Kevin shares his intelligence with Max to help him become a better student, while Max shares his physical prowess so that Kevin can participate in activities that would otherwise be out of his reach. They also share an imaginary world where they are knights in King Arthur's court, going on quests through the countryside (actually, downtown Cincinnati) to slay evil dragons (face-off against bullies) or rescue fair maidens (return a stolen purse to its owner). "The Mighty" is a moving portrayal of a childhood friendship, one that helps these two boys overcome their own mental and physical limitations. Chelsom effectively captures the dynamics of their relationship, conveying the sense of empowerment that they both experience when combined as Freak the Mighty. Chelsom also brings Kevin and Max's world alive with the whimsical use of magic realism, allowing the audience to see the world through their eyes, where the knights of Arthurian legend follow their every footstep. With the center of the narrative focused on Max and Kevin, "The Mighty" relies on the strength of the performances of its two child actors. Fortunately Henson and Culkin give outstanding performances as the boyhood chums-- Henson as a troubled soul who would rather hide than fight, and Culkin as a spirited boy who strives to break free of his ailing body's limitations. These two gifted actors not only deliver believable performances, but their scenes together exude a refreshingly honest chemistry. Sharon Stone (last seen in "Sphere" and heard in "Antz") gives a memorable performance as Kevin's mother, emanating the strength, compassion, and emotional vulnerability of her character. 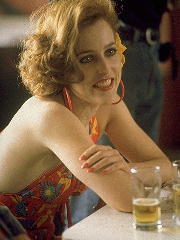 The rest of the cast is also strong, including an almost unrecognizable Gillian Anderson (Agent Scully on "The X-Files") who is cast-against-type as a trailer-trash friend of the family. A knight proves his worthiness through his deeds. "The Mighty" is a film full of surprises, switching effortlessly from pathos to humor, and tragedy to triumph. With the strength of its two central characters and the powerful bond that they share, "The Mighty" illustrates how you can find inspiration and courage in the most unlikely places.